Gear A, which turns clockwise, meshes with gear B, which turns counterclockwisWhen more force is applied through gear A, torque is createHow does the angular velocity of gear B change as a result? This is College Physics Answers with Shaun Dychko. When gear A turns clockwise more quickly it's going to drive gear B to turn counter-clockwise more quickly as well. 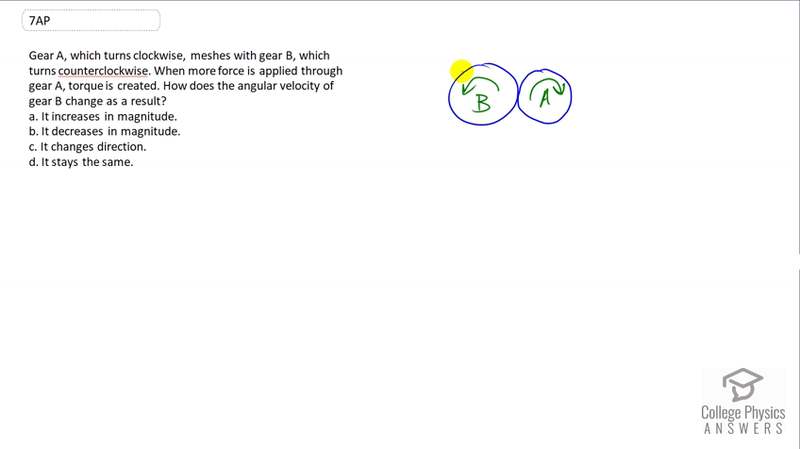 The angular velocity of gear B will increase in magnitude, and so the answer is A.